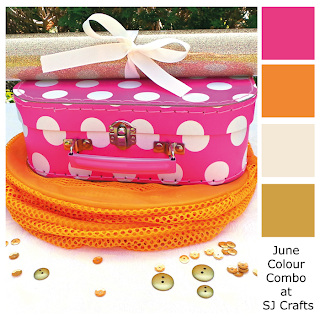 The new challenge for June over at SJ Crafts is a lusciously vibrant colour combination of delicious hot pink, mouthwatering tangerine, soothing cream (or other neutral) and a luxurious touch of gold. Straight away, this palette put me in mind of the colour scheme for our wedding flowers, so this was a perfect opportunity to get another wedding photo scrapped at last! With a lot of help from our friends, we did pretty much everything ourselves for our big day - from the stationery to the bunting to the favours to the catering and of course the flowers. It was hard work but worth every minute and we ended up with a day that was very much "us". We had to learn a few new skills along the way, and flower-arranging was one of them. Floristry did NOT come naturally to me - there were a lot of practice runs - but with the help of good old YouTube I got the hang of it eventually. A couple of days before the event, several boxes of flowers were delivered and we set about turning them into table arrangements, buttonholes, corsages and of course a bridal bouquet. This photo is one of the arrangements I made to decorate the Church - I'm hiding behind it, because it was around 5am and I was NOT looking exactly gorgeous!!! If you haven't already, you should definitely check out the Scrap 365 blog, it's positively bursting with ideas and inspiration! Whilst I luuuurve this colour combo, I did feel it needed plenty of white space to balance it out, so I started with a sheet of white Bazzill cardstock which I mounted on a sheet of hot pink to frame it. Ali had used mixed media to create an interesting background for her page, so I tried a similar effect, using Distress Paints in Picked Raspberry and Wild Honey with a Tim Holtz layering stencil Dot Fade and then over that I stamped some random text with Distress Inks in Picked Raspberry and Spiced Marmalade. Finally, I flicked some Heidi Swapp Color Shine about the place. Onto this background I layered up several patterned papers - I raided my newly-organised scraps first, then added a couple of sheets from the Crate Paper Flea Market 6" paper pad. The leaves were also cut from scraps using Spellbinders Nestabilities Foliage Dies through my Cuttlebug. I've sprinkled sequin stars here and there to add some golden sparkle. The "DIY" alphas added another touch of gold - these were Gold Tile Letters from the Flea Market collection by Crate Paper. The "Flowers" part of the title was made with Prima Canvas Alphas in white, which I've coloured with the same Distress Inks to create an ombre effect. The little words are Typeset Stickers from the Simple Stories DIY collection. Really lovely page, thanks for sharing it and the story behind it. Two challenges for the price of one too! Beautiful layout, the colours are stunning! I love that you created your own wedding, what an achievement! ! That is one perfect layout with perfect flowers and colors. I absolutely adore this, so fresh and beautiful! This is gorgeous, Annie! Loving the colors and all your beautiful layering and background work! such a fantastic piece of work! thank you for playing along with us at scrap 365!